We are experiencing some technical difficulties... This will hopefully be resolved within the hour. Fixed! For posterity, you can find the filterpasta version of this page that was up for an hour here. So it's not just halloe'en-ness? I never thought I would use this one. Me:A solid 7. Just be glad he does this only once. Or the white text on the light background. I got nose-prints on my screen trying to read the dialogue. I'd give it a five, not really enough to cause too much trouble on it's own, but definitly able to fuel other nightmares you might have. Q: On a scale of 1 to 10, how wrong is using scales from one to 10? The right way is scales from ZERO to 10. (Just have to say it. I can't stand the atrocity that 1 to 10 is). Also wrong, scales from -5 to 5 are the way to go. Having the "neutral" response be zero has desirable statistical properties. The page as a whole? Zero. Just the last panel? Maybe a 5. About on par with a General Mumble song. Goddamn, I know the feeling. There's nothing worse than having something be *almost* perfect. If it was farther off, you could just brush it off. But 99%. Being so close as to be within groping distance of something absolutely perfect. That's just frustrating. I feel for you, man. But take heart: this was still an amazing page. Nice, Spud! By the way, for my special Halloween thing, I might not be ready in time. I thought I'd write a nice little horror story. Also, I like the use of filters. Storytime: Anyone do special holiday sessions of their games? Like Call of Cthulu on Halloween, or fighting Santa Claus on Christmas? I have a session coming up today I'm thinking of inserting a few horror elements in (maybe a ghost). Unfortunately, the party is presently in the desert, facing a dragon. Might be tricky. Many years ago a group for a Supers campaign actually played out a slice-of-life Christmas session. They bought decorations, held a Secret Santa event, and even fought off mobs of holiday shoppers and would-be thieves to keep the local mall orderly. I didn't do much, the players did most of the work there. I did a Halloween-ish festival in the game I'm running two weeks ago (closest to Halloween that everyone was available). It was a no-combat session so everyone could relax and I could catch up on designing the next map. I'm actually planning on doing a freeform RP game with my new IRL D&D group. I'm thinking either a Silent Hill setup, or something based off my own stories, where a trickster god with a hidden agenda puts several individuals through a puzzle-and-horror-filled labyrinth of a castle with its own Genius Loci. Think "The Cube" with a gothic horror theme. ...Considering it's in two days, I really ought to prepare for either one. Might I consult you good readers for advice? 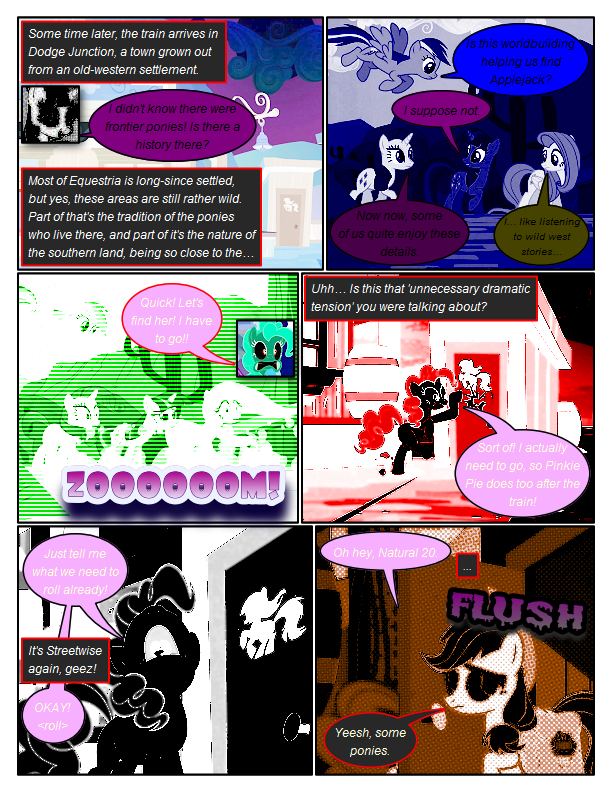 How about a slightly twisted, offputting version of ponyville, where everyone always smiles, and espouses friendship? "Friends help each other, so I'm going to help you become friends with everyone in town, even the mayor! The mayor is very important! She's responsible for spreading happiness to all the citizens!" Eventually, the party learns that pain is happiness, and love and friendship are all about spreading kindness and happiness to others. The mayor's house has all manner of torture devices, both physical and psychological. Everyone is so brainwashed, or so insane, that if they ever hurt another pony, or break a rule, they immediately report to her to be loved until their sins have been cleansed. Eventually, they meet the true monster in town. The midwife. When a foal is born, the mother is torn apart, by hand, as she sings a lullaby to her child with her dying breaths. He skin is ripped off, and her organs are crushed by hoof and yanked out, starting with least vital organs, and ending with her heart being wrenched free, after each of her ribs is pulled out, one by one. The heart is used to nurse the infant until it can be weaned. I could go on, but I'm sure you get the idea. Sounds like a Wednesday thing. In all seriousness, not that bad. It kind of makes sense when you think about it (or atleast the town's folk and the mayor). In fact, it sounds like the city is full of masochists, one non-leathal and one murderous sadists. ... Why do I keep thinking that I would be a friend of the mayor, weird. @Raxon: That seems... over-the-top. At least the midwife part. Also, slight contradiction: "pain is happiness" "if they ever hurt another pony" Hmm. Okay, how about if they ever break a rule? Also, it's less about them being masochists, and more about them having been tortured, drugged, and brainwashed. It's pretty obvious that none of them want to break rules and need to be "loved". Also, they are not allowed to bring harm to each other. Think the town from The Cutie Map, but with behavior reinforced through actual, horrific torture. In other words, imagine a town run by Granny Goodness. She's basically the goddess of torture and child abuse. @Raxon: The midwife part doesn't really make sense. Killing every mare that births a foal is a waste and would quickly turn it into a town with almost only stallions. It's not a sustainable situation. I also think it's too much "blood and gore" type of horror. Also, I'm pretty sure that brainwashing an entire town wouldn't really work unless you're talking about supernatural means with literal mind control. And if they're as brainwashed as it seems they are, them even breaking rules doesn't seem possible. If they had the presence of mind to break a rule, they would not be perfectly brainwashed and probably wouldn't seek out punishment. Here's an idea: Instead of the body horror of how families (don't) come to be, let the family ties in that town be really very strong. If anyone breaks a rule, the rest of the family brings them before the mayor to be "loved". The victim could be a dissenter, like a rebellious child. In this case, them getting brought before the mayor, tortured and further brainwashed would not be a case of the brainwashing failing for an oddly specific amount of time, but as consequence to familial pressure. As an added bonus, this could also be used to enforce the idea that the brainwashing is not just something done by the mayor to the town's populace, but mostly something done by each family as a whole to every individual family member. It would also mean that killing the mayor would not help at all. It's human nature to want to believe that there is a root to all evil, but if you took that away from the players (possibly with the added gut-punch of it actually getting WORSE when they kill the mayor), I believe it would be much scarier. Edit: Wrote this comment before seeing your last one, but I think it still applies, especially with subverting the players' idea that there is one person at the center of it all. Let them _believe_ that. Let them be _convinced_ that all this brainwashing and torture business is done solely at the behest of the mayor. Maybe the aforementioned rebellious child could echo that sentiment, believing, in their childish naiveté, that everything would be better if the mayor was gone. And then, they kill the mayor and... nothing changes. And maybe it gets even worse. At least the mayor was careful to treat the victims' injuries afterwards and to never kill them, for example. Edit2: Of course, this doesn't explain how the brainwashing first came to be, but I'm sure you can think of something. Maybe it WAS initially supernatural. An experiment gone wrong. Whatever. Thing is, it would only require one generation of ponies to be affected by it for it to become self-sustaining. If everyone in the town was suddenly and magically brainwashed, new foals would grow up already brainwashed by their parents with no further supernatural influence. Hell, as an added twist, it could be that the community discovered that some families were rather a bit overzealous with their "love". A dead or almost-dead foal is too much of a liability. So, maybe, after a few generations, they created the position of mayor specifically to handle those brainwashing duties in a "safe" manner. And by killing the mayor, the party reset the town to the pre-mayor state. Nice job breaking it, heroes. Until the town instates someone else as mayor, of course, and it all goes back to the way it was before. I like it! Stealing this for my brainwashed slave factory setting. Basic premise is that hundreds of years ago, an enterprising man had the idea to pull a railroad trick. He advertised room and board for factory workers, plus good quality women to sleep with and settle down with. Well, workers signed up in droves! They never saw it coming, but the factory was built on an island, far off the coast, in treacherous waters. There was no escape from the island, and within fifty years, they were all brainwashed. Anyone dissenting or causing trouble was immediately dragged by guards to a dark room. A magical room with no light, or sound, even your own voice is silent. There is no feeling of touch, either, there's just no sensory input whatsoever. Well, eventually, the factory owner died, but nobody ever knew of the factory, so the workers, not knowing what to do with nothing coming in or going out, could not bear the thought of not working, or worse, being sent to a dark room. Naturally, they devised a way to fix that. Disassemble the items they made, and then reassemble them on the line. And this is where the party will be finding themselves, this island with the useless factory. Where food is summoned via cleric spells, and young girls are schooled in domestic duties, while young boys are taught day in and day out, every facet of the job they were born to do. Nobody knows how to speak anymore, except as is related to their duties, and the most basic necessities. Everything revolves around the factory. Basically, their goal is to find a way off the island. It's like the people have lost all will to live, but have no choice, because the factory is always top priority. What I'm expecting is "This place is insane and depressing. Let's get the hell out of here." Not entirely sure why ComicFury ate my post. Suffice it to say... I'd say that's a tad excessive, Raxon. Mostly the midwife bit. ... Perhaps in the future, I should hold off on writing horror right after playing a horror game. How does the population ever remain stable? I have no idea. I wrote the whole thing after a horror game session, and my mind tends to be a little effed up after those. Pretty sure I already mentioned the time we got polymorphed into turkeys by a witch around Thanksgiving. Not even regular turkeys, but cartoonishly proportioned extra-clumsy turkeys... While the local village was about to start the traditional turkey hunt component of their annual harvest festival. My Ranger was very upset that he had to gut some hunting hounds with his stubby turkeylegs. The witch died screaming in a thousand pieces for that one. Oh my gosh, is this a Story of the Blanks thing? Personal bad news: I missed whatever drama the rest of you are talking about. I guess that means Pinky found Applejack in the toilet. I think she found the toilet so well she didn't even notice AJ, actually. It appears we have luckily managed to miss the conjunction by one update. One does not even want to wonder what would happen if it all aligned properly... The damage done would be probably irreparable. 2) Speaking of Trains anypony else notice the Home Alone and Trains Planes and Automobiles refrence on the train? anyway's as all of you know unless you've been living under a Rock ( -_- ) is that this Saturday is Halloween and The Leaked Episode of MLP from like a month ago is the episode that airs on Halloween. So Scare Master is the next episode aka episode 21 so we shall discuss it next week. As someone who grew up and went to school with a good mix of Amish and German Baptists, I found this episode hilarious. Cap'n the internet can't handle any more ships! If we engage now, the cannon will get us for sure! Oh good, I didn't care for the zalgo page. Should've left that up for the day; not everybody is here the moment the comic updates. Awwwwww. I missed the filterpasta version that was up for an hour! Sigggghhhhhh. It's necessary sometimes for the DM to NPC a PC in order to move the story along... but sometimes... sometimes I wish they didn't have to. If it's not too late for storytime: Tell of a time when a GM NPC'd a PC! And the terrible (or hilarious) shenanigans that resulted! FUN FACT:Satan's number is actually NOT 666. It's actually 616. There's dispute on that, but let's just go with whichever one has become ingrained in our popular culture. For anyone actually interested and not just being pedantic, here's some education. Isn't the Exact quote "Let him who has wisdom calculate the number of the beast, for it is also the Number of Man; and the number is six hundred three score and six. "?